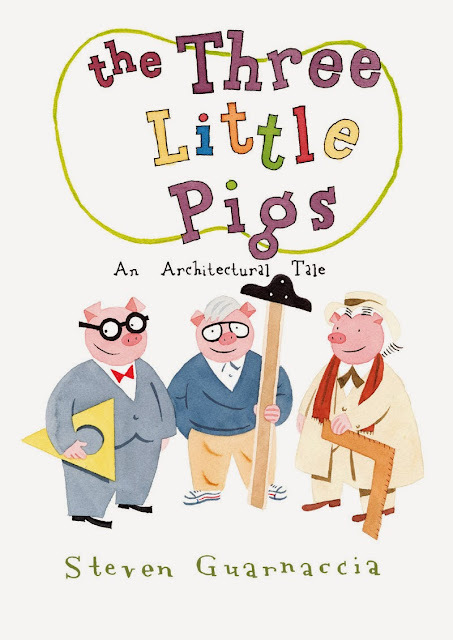 the Three Little Pigs: An Architectural Tale is the newest picture book/design primer for children from Steven Guarnaccia, former Op-Ed Art Director at the NY Times and current chair of the Illustration Department at Parsons the New School for Design Steven Guarnaccia. 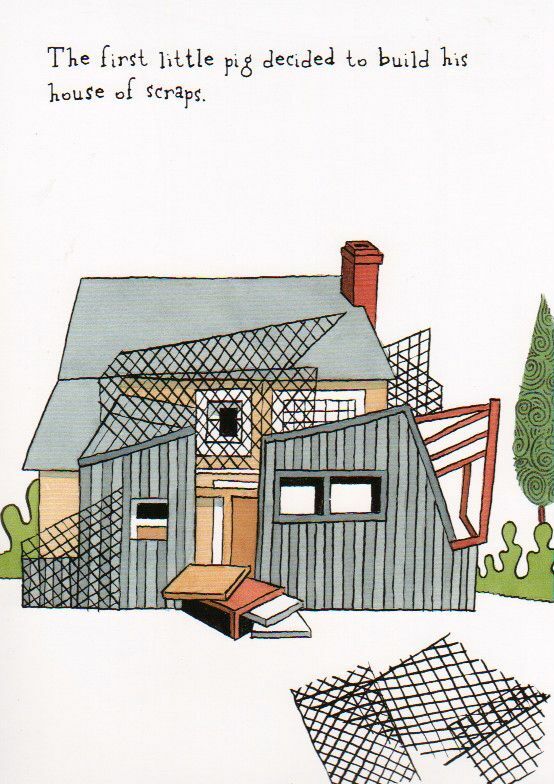 As an art school drop-out, (from the Otis College of Art and Design during the decade it partnered with the Parsons School of Design, no less) there is much about this book that appeals to me and inspires me - to learn more about the architect-pigs in the book and think about houses and buildings in a different way. For those of you who share this interest, be sure to visit the Moleskine website where there is a very cool video of one of Steven Guarnaccia's sketchbooks and its contents. 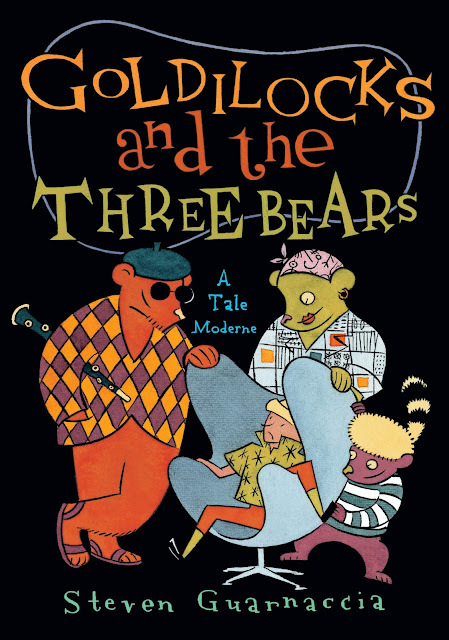 I can't think of a better way to hook your kids and start some really great conversations and maybe even projects and sketches than reading the Three Little Pigs: An Architectural Tale. 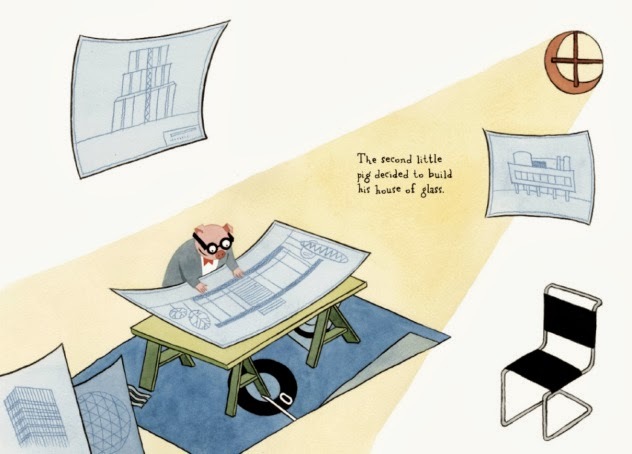 The endpapers of Guarnaccia's book are filled with sketches of great pieces of design and architecture fame from the 20th century and can serve as a key to most of the pieces in the book. For the rest of the works that you may not recognize, thank google and wikipedia. 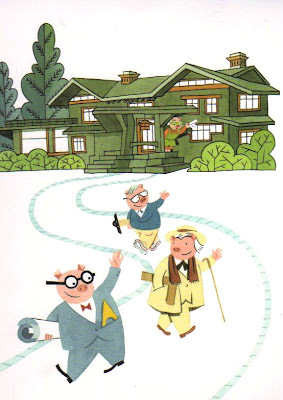 The book begins with the three pigs setting out to make their way in the world as their mother waves goodbye to them from The Gamble House in Pasadena, CA, built in 1908 by masters of the Arts and Crafts movement, Greene and Greene. 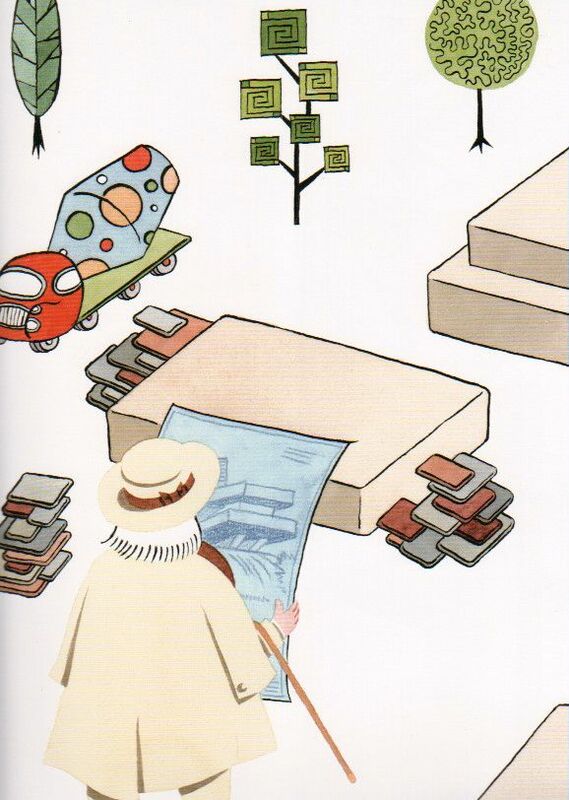 Architects all, the pigs, with nods to Frank Gehry, Frank Lloyd Wright and Philip Johnson, set off to make their way in the world. 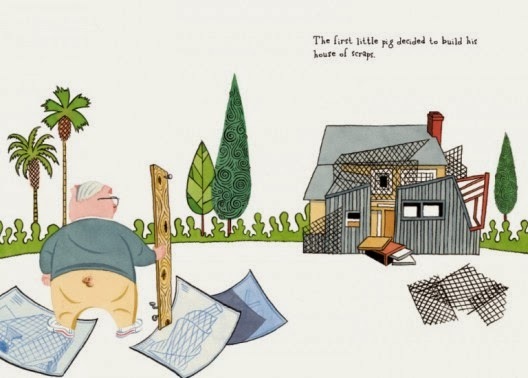 The first little pig takes some scraps and builds The Gehry House, Frank Gehry's own home in Santa Monica, CA. I grew up about a mile down the road from this house and marvelled (and, to be honest, snickered) at it when I passed it as a child. I didn't find out who Frank Gehry was until almost a decade later when I was in college and saw Gehry's Standing Glass Fish sculpture at the Walker Art Center in Minneapolis and put two and two together - and gained a deeper appreciation for Gehry's vision. The second pig, Philip Johnson, builds Glass House, in Connecticut, which was completed in 1949. 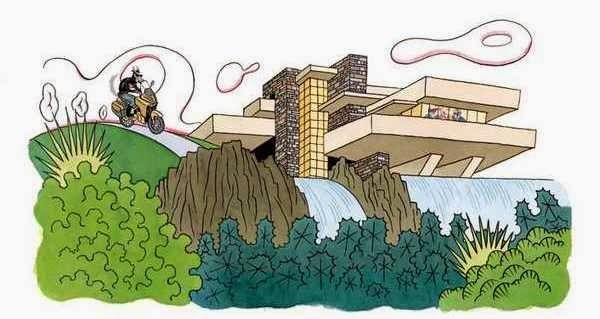 The wolf, who makes quick work of Gehry and Johnson's houses, moves on to the third little pig, a.k.a Frank Lloyd Wright, and his home, a.k.a Falling Water, which was built in 1934 in Pennsylvania. A trip to the flea market, which also doubles as yet another ruse to trick the wolf, lets readers see sculptures by Phillipe Starck, Buckminster Fuller, Ettore Sottsass and Isamu Noguchi sitting next to Aldo Rossi's espresso pot, a chair designed by Michele de Lucchi and a rug by Nathalie du Pasquier, which Frank Lloyd Writght pig hides himself in as he rolls downhill and away from the wolf. 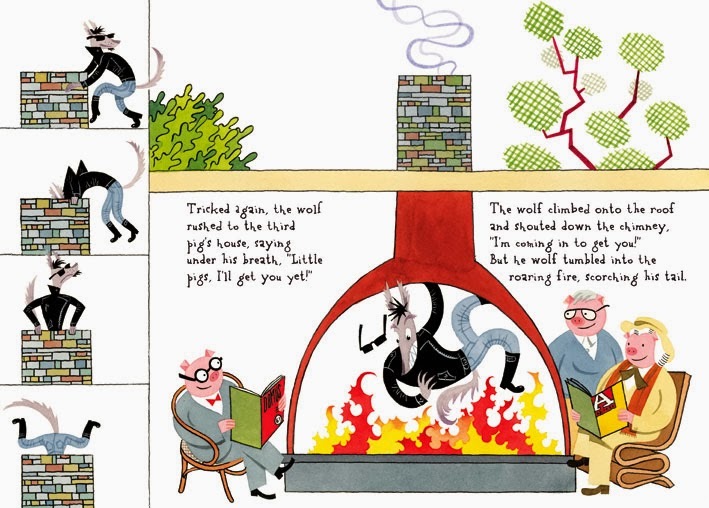 Guarnaccia does favor the traditional ending of the Three Little Pigs story in the Three Little Pigs: An Architectural Tale, perhaps to showcase the cool fireplace in Frank Lloyd Wright Pig's hosue! The story of the three little pigs and their house building adventures makes a great frame to hang this architectural tale on. 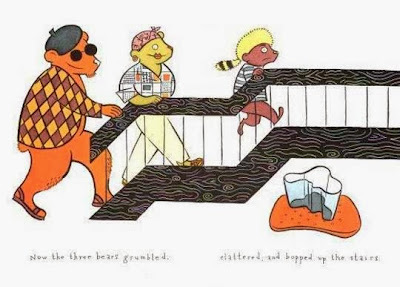 But, what this story is really about are the designs of the houses, and that is fine with me. I thoroughly enjoyed reading and then researching all the little bits and pieces that go together to make up this book and I think that you and your children will as well! 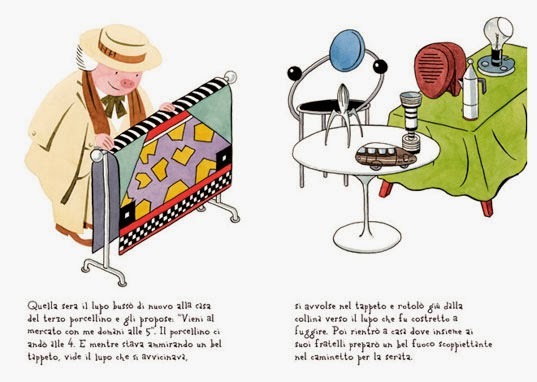 As with the pigs and their houses, Guarnaccia uses the bears and their furniture to introduce young readers to the design greats, including Ray Eames, Isamu Noguchi and Alvar Aalto as well as ideas about form and function.